My buddy Rick gets ideas into his head. 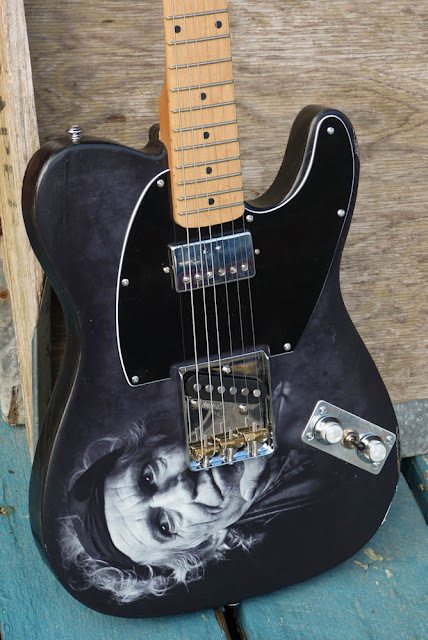 In this instance: he wanted a Keith Richards-inspired Telecaster. 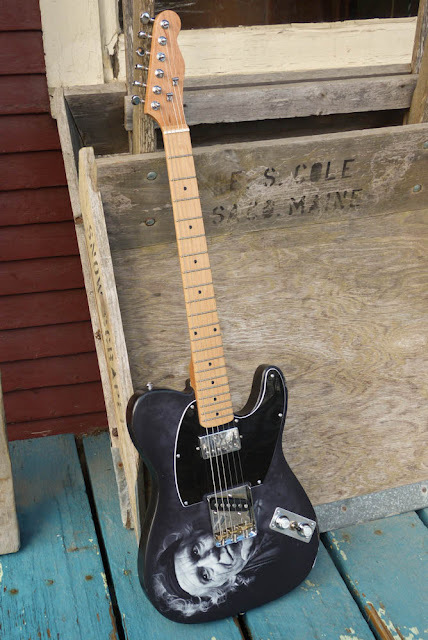 He got it -- after scrounging a cheapy Asian neck (which is, frankly, just fine) and one of those pine "Esquire prototype" bodies that float around on eBay. 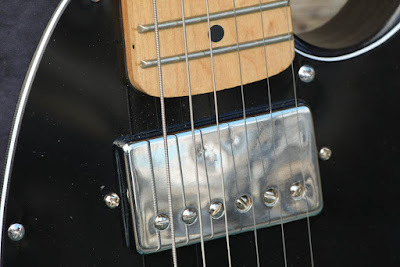 He also sourced the older humbucker pickup in the neck and the GFS "fatbody" Tele bridge pickup -- which is awesome. The rest is my own scrounging. Putting together something like this from parts and slightly modding said parts where needed is about a 2 1/2 hour job for me, plus or minus a half-hour figuring out what parts are needed. Since it was Rick's birthday just recently, I decided to finish this off today as I had a window this afternoon to do it in. It'll then get played tonight at a show! Because of the "prototype" style control plate, I cut-down the pickguard edge. 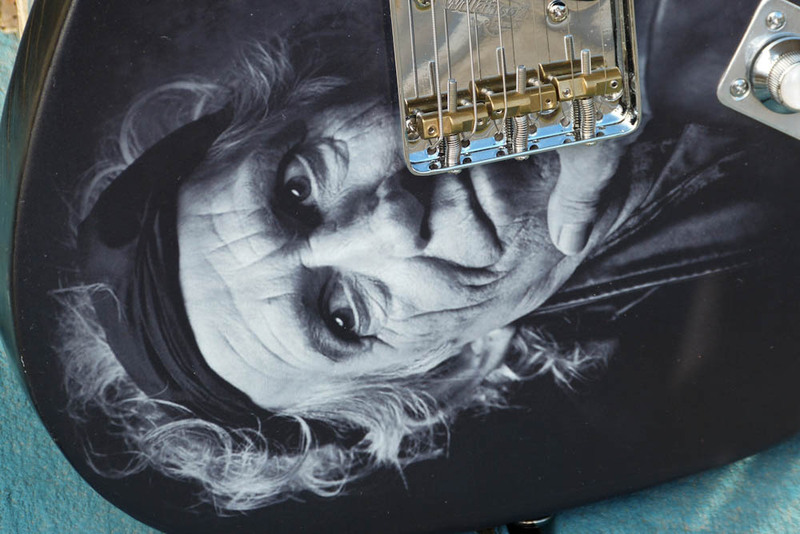 The "Keith" image was printed on the body by an artist friend of Rick's using a fancy new-age printing device. 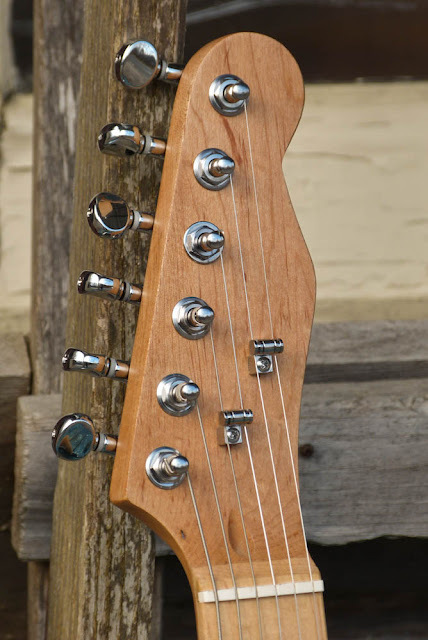 It's pretty amazing that it did such a good job -- even on grainy pine. 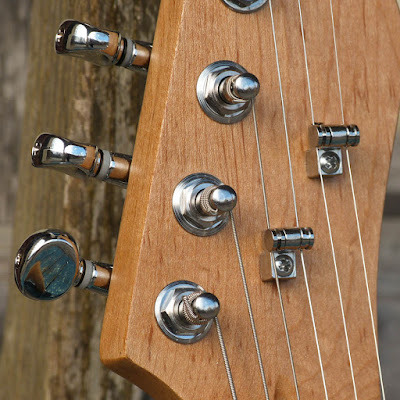 I used some Gotoh-style copy tuners (good quality) and a couple of roller string trees. Even though this doesn't have a whammy, roller string trees sure do cut down on snagging above the nut. 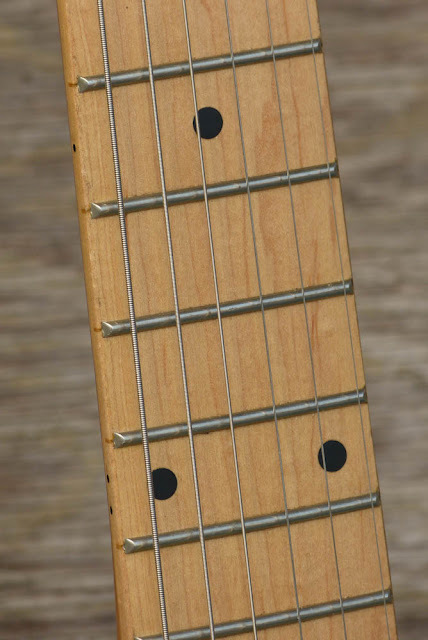 The jumbo-fretted Asian neck is finished in a typical satin and the neck profile is roughly equivalent to any modern Fender you'll play. I installed the humbucker "backwards" to allow for dialing-in a bit more clarity with the polepieces. 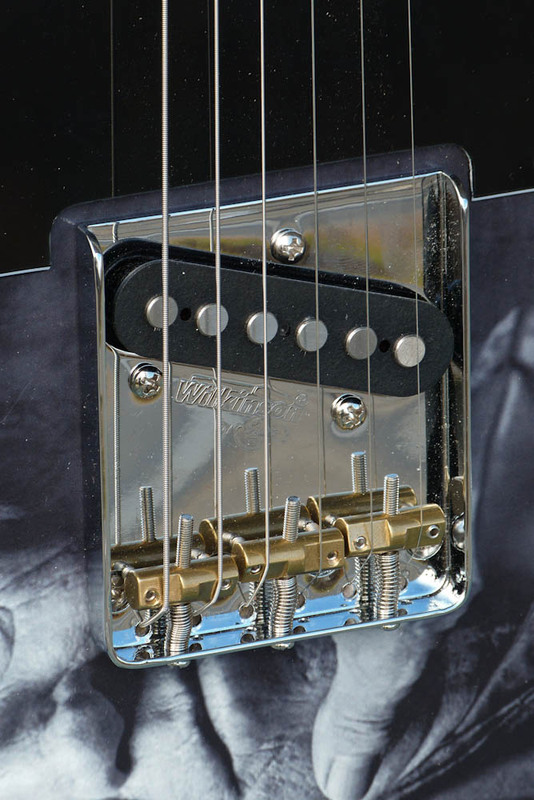 The Wilkinson bridge is an eBay find, pre-loaded with compensated brass saddles for about $20. I'm always happy with these bridges -- though I'm not a big fan of the Wilkinson logo front and center. 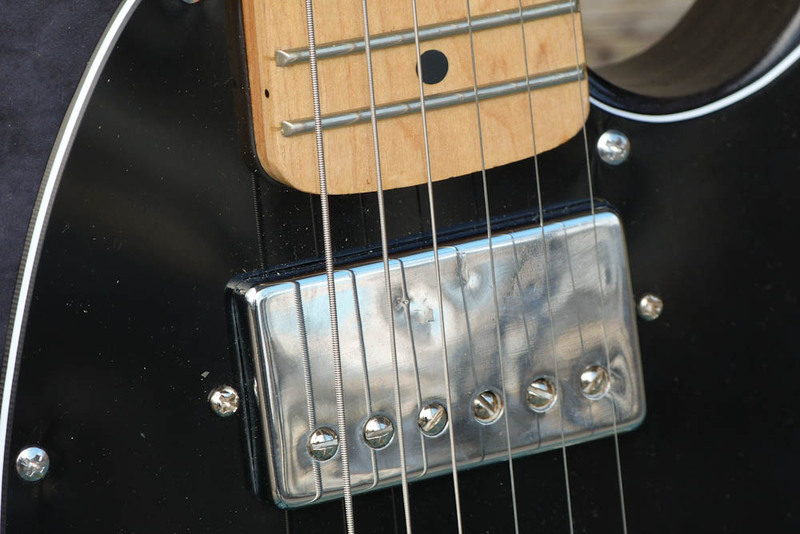 The GFS oversized-polepiece bridge pickup is downright awesome, though: it sounds a lot like a typical Tele bridge pickup but has output power in the same range as the neck humbucker. I'm convinced. 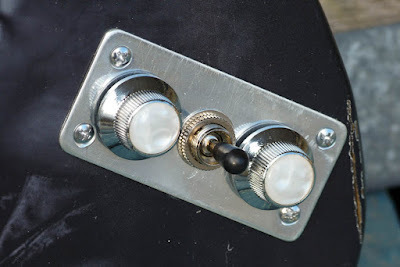 The pearloid-topped, chrome-plated brass knobs are the crowning touch of the control plate... plus the Gibson-style 3-way. It was a bit of an annoyance to cram it all on there but I have the switch throwing at a diagonal which makes it feel less cramped. You can also "pinky wrap" the volume control for swell effects. 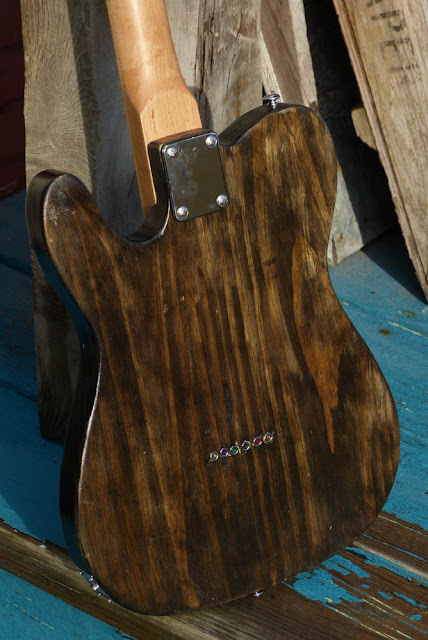 The back is nothing to write home about -- it's a murky grey-brown finish. 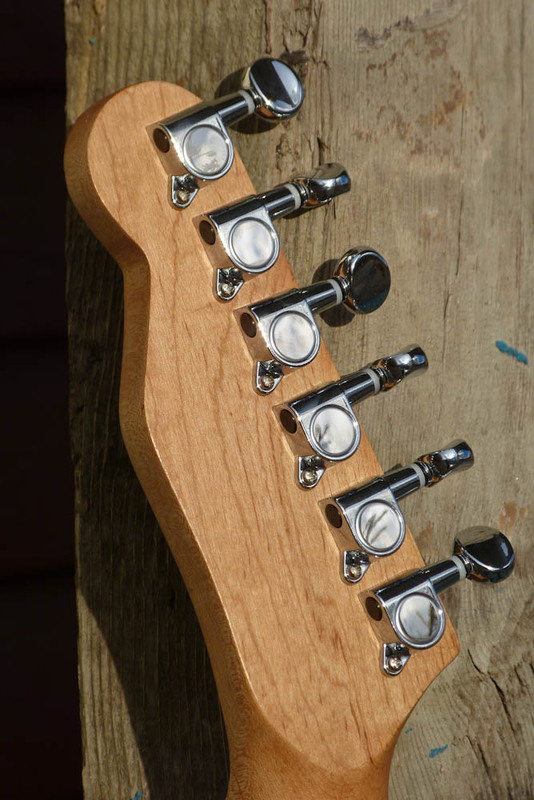 I like the sound of pine bodies but I generally find they work best with a bright color stain and some very simple rubbed-on poly finish. Case in point: this same type of body done in "Speedball green." Most content (C) Jake Wildwood. Please ask for permission before reuse but feel free to share.